Memory is at the heart of learning through trial and error. We are born knowing very little; it’s all uphill from there. Families give us a leg-up by not having to be feral children dependent on instinct. They give us enough leeway to own what we learn. And what we learn is what to expect next time. Expectancy, recognition, identification, meaning, and understanding are gifts our sheltering families make available to us. Leading to judgment, which opens the way to appropriate behavior. All courtesy of the families that give us room to fall on our face, pick ourselves up, and have at it again. Getting that one more chance makes all the difference because we remember the last time, and vow to do better. Our efforts add up as we go. Practice makes, if not perfect, at least for improvement. Families give us the chance to engage through successive approximation, so that what we aim at, we eventually attain. Not trial and error just once, but again and again, showing incremental improvement each time. If we put in our ten-thousand hours of consciously appreciating those decreasing increments, we find ourselves right where we wanted to be two years ago. Courtesy of memory, room for experiment, the wisdom of patience, and the willingness to try. Join all of the above to the life force that urges us on from every one of our cells because we need to do something with all that energy our mitochondria provide, and we have the formula for success via one earnest attempt after another. Knowing almost nothing in particular at birth opens the door to the possibility of adapting to unanticipated conditions and situations. If we were born fully equipped with everything we needed to know, the first surprising change we encountered would throw us off our stride. We’d have no way of coping with novelty, and it would be our downfall in the end, which would come sooner rather than later. No matter how trying family life can be, real life is far worse. Family life is a trial run for the time when we must face every challenge on our own by standing on the two feet we were born with and that our families have encouraged us to develop into an asset. Thanks, Mom; thanks, Dad; we owe it all to you. Oh, yes, and to the kids who grew up alongside us, no matter what pains they were to us at the time, or we to them. Families are our first schools. In that sense, we all start out being home schooled. What do we learn? To be ourselves. To speak our native language. To engage. To babble, then invent our own patter. To discover meaningful speech. To understand others. To understand ourselves. It all begins at mother’s breast while we are fed, warm, and safe. She smiles; we smile. She laughs; we laugh. She oohs; we ooh in response. Then we ooh meaningfully at the sight of her smile. She giggles; we giggle. Peek-a-boo! We sense we’re onto something. We play off against her; she plays the same game. Back and forth; forth and back. There’s no stopping the banter. Then the flow of talk. Her turn, our turn. Then the full exchange, the loop of engagement of perception and action at the same time. She playing her part; we playing ours. Equally engaged. Paying attention. Watching, listening. Being watched; being listened to. Taking turns. Conversing. Being ourselves with each other. Not alone anymore. The biggest discovery of our lives. Or not, if there’s nobody to play the game with to get us started. Many of my projects are based on a close relationship to the natural history of the region in Maine where I live. Projects, in fact, establish a kind of intimate relationship, very much like building a friendship over time. I strive to respect my subjects by focusing on their integrity, the set of qualities that make them what they are in achieving a particular identity. I think of women building human relationships day-by-day, of men making tables and bookshelves and model boats by shaping and putting their pieces together. It takes the same qualities of mind to accomplish each such project, women concentrating on human qualities, men on the qualities of the materials they put together toward a given end over time. Please forgive my resorting to stereotypes. Of course women can be artists, CEOs, and presidents; men can be caregivers, spouses, and friends. I am speaking from a general impression built-up over a lifetime of some eighty years. My point is that human relationships are a kind of project that requires maintenance and attention if they are to work out as we hope. Projects and relationships are examples of our wayfaring, of taking one step at a time until we get where we want to go. That is how we build bridges, skyscrapers, families, organizations, and civilizations, each contributing as she is able during whatever time he has to put in. Most significant actions take time to consider, prepare, plan, assemble, and execute. Sometimes we operate as a team of one, at other times we join together to make up teams of five or nine or hundreds or thousands, all aiming at a common goal. That synchrony and coordination within and between ourselves is what we get good at by paying proper attention to the details involved in such engagements. Engagements within ourselves at different times, and with others distributed through a field of activity. One of our chief characteristics as workers in the world is whether we are team players or do better by ourselves working alone. But always our jobs require suitable attitudes, workplaces, preparations, materials, tools, skills, and sufficient time to get the work done. From making a PowerPoint presentation to constructing One World Trade Center to building friendships that last a lifetime, our actions require attention to detail at every step of the way. And that is precisely what we wayfarers are good at, paying attention to what we are doing as we go. In every instance, our going is a stage in the journey of a particular person who is mindful of what he is trying to accomplish, and pays attention to what’s happening around her at every step of the way. Every stride of that personal journey changes the point of view from which we look out at the world. The reason we are wayfarers is to deliberately change our points of view so that we discover what has been hidden from us before. Our aim is to make a difference in the world by making use of the new perspective we have gained from our travels. Our every action is aimed at adding to that difference, of accomplishing what we want to do in our lives. By acting to bring about change, we try to build the sort of future we want for ourselves, our loved ones, friends, associates, and neighbors. In the terminal moments of a dream I had on the morning of March 10, 2014, I found myself loaded with gear in both hands, struggling up a crowded escalator. I met a series of obstacles at every level, but could not find my way to a particular street, which I could reach by traveling north, while again and again I found myself forced to move off in other directions. I was determined to get to that street, but events in the dream kept turning me aside. My awakening mind linked that dream to similar dreams of being thwarted in a lifelong series of similarly wayward excursions. When fully awake, I had the distinct thought that such dreams are models of my mind, much as my mind, in turn, is a model of my world. It struck me that what evolution has wrought in the physical network of the brain is a tool to be used for modeling the world in navigational terms such as goals, journeys, routes, destinations, distances, maps, obstacles, distractions, pathways, landmarks, wayfaring, migrations, and so on. We are primarily a mobile species that conducts its business by standing on two legs and walking toward specific destinations as goals. Our minds are made to support such a lifestyle. When immobilized and desensitized by sleep, what else would we dream about? During breakfast I made four pages of notes in a steno pad detailing such a vision. It made sense at the time. It makes sense to me now. Animal life is . . . well, animated, always on the go. It moves about in search of food, water, mates, shelter, vantage points, and so on, as well as to avoid dangerous places, enemies, competitors, rivals, harsh conditions, and fearful situations. Animals have appendages that enable them variously to crawl, creep, walk, run, gallop, scamper, hop, leap, fly, glide, slide, slither, float, drift, paddle, swim, dig roam, and explore their way about their habitats. They make or adopt paths, trails, routes, flyways, tunnels, home ranges, migrations, forays, escape holes, dens, nests, warrens, and other artifacts to accommodate their travels and activities. To accomplish such feats, animals have brains that coordinate the movements of their bodies and appendages, enabling them to move about and thrive in the habitats to which they are suited. Minds, to the degree they have achieved them, allow those animals the spontaneous coordination of sensory inputs with motor outputs in the construction of engagements intended to fit individual animals to the environments and situations they encounter in the course of meeting their needs and desires, either instinctively or as informed by memory of such efforts in the past. In the particular dream I mentioned at the start of this post, I could not coordinate my sensory impressions with any kind of meaningful action because sleep results from the uncoupling of just those two capacities, leaving my goals unsupported by any means of attaining them, which is my plight in a great many of my dreams. Leaving me laboring mightily to accomplish the impossible in being stymied in my search for a route leading where I want to go. If wayfaring is the essence of consciousness, as I believe it to be, then dreams leave me in a present state without the backup of memory to remind me how I might have found my way in the past. In dreams, I am only half-human. I have access to selected desires and a rapid succession of images, with no way to join the two in a successful effort to do what I want to get done. My brain may be sufficiently awake to maintain my innards in a state of semi-automation, but my mind is left to twiddle its figurative thumbs for lack of any ability to move, depriving me of the essential quality of animate life. Questions, always questions. Setting goals is absolutely no guarantee that we will fulfill our dreams. Hopes, wishes, desires, and all the rest are states of mind that spur us to action. Achieving goals requires that we have the right stuff to stand on the three-tiered podium at the end. At the Olympics, finishing fourth puts us at ground level. Merely making the effort doesn’t count. Medals are precious because rare; they aren’t given out for sweat, good intentions, excuses—for anything less than peak performance. Mental events, too, are won by those who have bested their rivals. Striving, competition, cooperation, and comparison are at the heart of our mental activity, conscious selves, and engagements with the world. From observations of my own mind, I find that comparison between goal and attainment, or past and present achievement, generates a signal as an urge in my brain that sets a particular engagement off on yet another round of action, which triggers another round of both perception and judgment. That urge gradually fades only to the degree it brings me closer to my goal. Our engagements driven by perception, judgment, and action are more circular than linear or, more accurately, helical like a coiled spring or inclined plane wrapped around a drill bit in that our rounds of mental exertion never bring us back to exactly where we were when we started, but somewhat displaced; hopefully, closer to our goal. Mental comparisons generate signals in proportion to the disparity between goals and accomplishments, between where we were and where we are now, between remembrance and current perception. With consciousness, the gap’s the thing. The gap between images cast on the retinas of our left and right eyes, giving rise to depth perception. Between sounds as heard by our left and right ears, producing a sense of distance and direction. Between motions in opposite directions as told by sensors in our left and right semicircular canals when we turn our heads, generating a sense of a counterbalance within a gravitational field so we don’t topple over. Consciousness—what we are aware of—is not found in neural signals themselves but in the disparity, discontinuity, or discrepancy between two signals in, say, adjacent cortical columns. Comparison between columns creates a polarity or duality that tells the difference between them, consciousness residing precisely in that gap along a scale of what might be expected for good or for ill. For bringing us closer to or farther away from our goal. So do we achieve tier one, two, or three on the podium, our reward for the care and effort we put into our engagements, the Olympic event we call life. 370. Do We Make it or Not? Setting goals is how we guide ourselves in getting ahead, how we navigate this life of ours day-by-day. But gauging how close we come to attaining those goals is another matter entirely. To head off in a particular direction makes for a good start; but to arrive where we want to go is not a sure thing. Do we make it or not? Do we even come close? That is the question. Either we do or we don’t. If we aren’t there yet, do we still have a chance? Do we have enough time, money, energy, and stamina to keep going? If not, what then? Set a lesser goal? Retreat? Call for help? Give up? As it turns out, setting goals is only a hypothetical beginning. The real show is what happens in pursuit of that goal. It’s easy to make New Year’s resolutions, something else again to stick to them. Of the thousand entrants in a marathon, only one will be first across the finish line. Politicians are hesitant to enter races they may not win after all, risking the raising and spending of millions of dollars for the privilege of defeat. In seeking goals, follow-through is crucial. Sticking with the challenge, even as it intensifies and we grow weary unto exhaustion. And then adapting to situations we didn’t anticipate. Life is spent modifying and renewing our commitments, hoping we get a second and third wind, pushing on as best we can. Proximity to our respective goals can make a big difference by renewing our dedication to the task we have set for ourselves. Do we have what it takes to go all the way when the going gets tougher and tougher? We’ve trained to be at our best at the start of the race, but what about near the end when we discover how young and powerful the competition is, and how painful every stride that we take? We live by setting goals and striving to achieve them. Roughly speaking, our first life goal is to grow into competent human beings. Our second is to discover who we are and what we hope to accomplish. Our third to make a livelihood for ourselves by developing and practicing our skills. Our fourth to find a partner and establish a family. Our fifth to support the community that in turn supports us. Our sixth to reinvent ourselves in our maturity to fill the gaps we may have missed. Our seventh to go beyond what we have achieved to see just how far we can go before we die. To live such a life, we set a series of goals, then strive to achieve them through a course of successive approximations. We probably won’t end each stage where we thought we would, but we’ll reach some equivalent we had not imagined for ourselves. We pull ourselves up and ahead by working as hard as we can, stage after stage, always within the situations we meet along the way. The steepness of our climb may vary, but we advance in proportion to the attention we focus on our personal journeys, and the effort we put into our daily engagements. To achieve our grand life goals, we work toward lesser goals day-by-week-by-month-by-year-by-decade. Our days are largely consumed in setting and trying to meet the expectations we impose upon ourselves from morning to night: getting out of bed, taking a shower, getting dressed, fixing breakfast, getting kids off to school, going to work, making appointments, attending meetings, shopping, and so on. Our daily routines are based on deciding on and then attaining the goals we set for ourselves on any given day as a matter of course. In this, we are primarily responsible to ourselves in conducting our life activities according to the master route map we have drawn up for living our lives, which in practical terms we live one step at a time. Our life is our life, the one we have imagined for ourselves and then work to achieve. Lived not on some grand, idealistic scale, but worked out detail-by-detail in one project after another, all adding up to the life we actually live through a series of engagements to which we devote our attention and effort as best we can, hope after worry after wish after bias after desire after want after need after duty after whim after commitment after question after doubt after whatever motivates us at a particular time and place. So do we invent ourselves one step at a time, each slip, stride, leap, or shuffle adding to the journey of a lifetime. Darwin’s interest 140 years ago was in comparing human minds to animal minds from the point of view of evolution. I devoted my last post to a brief treatment of his findings. My interest today is in comparing the dimensions of my personal experience of my own mind with the notion of artificial intelligence. The basic assumption is that artificial intelligence is in some way based on the genuine article, human intelligence, of which any given mind is but one unique example. What is the connection between the two? Introspection has a bad name because scientists keep imposing their so-called objective standards on its fundamentally subjective nature, so any qualities of individual intelligence keep getting thrown out with the bath water. Accepting the intimate, subjective nature of personal experience, I offer my findings concerning the facets of intelligence I discover in myself, not because I am egotistical, but because my findings are based on a thirty-years study of the one mind I have immediate access to, which happens to be my own. What I find is a mind divided into three parts: perception, judgment, and action. The first part answers the question, “What’s happening?” The second, “What does that mean?” or “So what?” The third, “What should I do?” The three parts taken in serial fashion lead to my engagement with the external world, which I divide onto four levels of nature, culture, community, and family. My proposal is that my intelligence is spread between all four parts of the continuous and ever-changing loop of engagement between my inner and outer worlds. Perception contributes its share, judgment its, my behavior its, and the world I live in contributes its share on the levels of nature, culture, community, and the family I live in. My mind absolutely depends on there being an outside world to connect with and seek guidance from. The natural and humanized world I am born to contains a good share of my personal understanding and intelligence. It is up to the inner parts of my mind to figure out how to engage the external parts so that I fit in as an integral part of our common planet’s share of universal intelligence. In this post I can’t fit in much more than a partial listing of some of the dimensions I discover from studying my own experience in perceiving, judging, acting on, and engaging with the inner and outer worlds I have been given for exactly one lifetime. I start with the dimensions of my personal perception, which include: arousal, excitement, expectancy, curiosity, my personal perspective at the time, my outlook, the sensory qualities I discover, the level of detail I observe, and the concentration and attention with which I reach out as the price I pay to observe anything at all. The result of that effort leads to a sensory impression made up of contributions from my various senses, the clarity with which I regard that impression, the aesthetic framework within which I receive it as an integral image composed of many complex relationships, together with the awe and wonder that well up within me. Leading to a recognition of what it is I am witnessing, an interpretation of its nature, and a linking of that interpretation to conceptions I have derived from previous rounds of perception. Then my faculty of judgment takes over from perception and tries to figure out the significance and meaning of that phase of my engagement. Immediately I am confronted by the situation I am in as modified by my current perception. That situation takes shape as its various dimensions become established by my streaming experience and engagement. I understand what’s going on to some degree, derive meaning from that understanding, partly by intuition, partly by direct perception of the latest bulletin from the exterior. I compare that meaningful understanding to what it was a few moments ago, developing a sense of how things are developing in comparison to what they were when I was last moved to act, that comparison giving rise to a delta signal that spurs my current state of conscious awareness. I am immediately aware of the polarity of what’s happening from my point of view—whether it makes a good or bad fit to my expectations. That disparity stirs up a new round of thought, which I measure against my biological (survival) values, taking into account the emotions I find welling up as a result of my expanding experience. My intuition and imagination come into play, stirring my judgment to review my priorities in this particular situation and come to a decision of how best to direct my life force into an appropriate course of action. If I recognize the drift of the situation as being one I am familiar with, I resort to a reflex or habitual action, mimicry of actions I have seen others perform, familiar routines dictated by prejudice (prejudgment) or ideology. I set a goal and begin to plan my physical response through a particular project, sequence of steps involving relationships I can count on with others, or call on familiar skills, gestures, postures, and other behaviors that might help me reach the goals I have set for myself on this particular occasion. With the result that perception and judgment have led me to act in the world on a level appropriate to the situation I believe myself to be in. In my next post I will deal with the possible dimensions of what happens on the level of nature, culture, community, and family as a result of the action I have taken in the context of my grasp of the situation I am trying to develop or modify through exercise of my situated intelligence. Again, what I am trying to do is explore the complexity of the everyday workings of our minds that we collectively gloss by the word “intelligence,” with an eye to our hopes and fantasies for the achievements of machine or “artificial” intelligence which is rapidly trying to substitute for the native version I am here roughing-out in these posts. Self-reflection is a process you go through to understand yourself better than you do now. In CONSCIOUSNESS: The Book, I call it introspection—looking inward. Basically, it is thinking about thinking. And about seeing-hearing-touching-smelling-tasting. And experiencing emotions. And remembering. And planning to do something. Self-reflection directs your personal attention to everything going on inside of yourself that you can become aware of at the time. Particularly to projects and relationships you are engaged with. The problem with self-reflection is that nobody tells you it’s a good thing to do, much less how you might go about doing it. This entire blog is about me self-reflecting on what concerns me at the time I write each separate post. Now I’m going to share the deep secret of how it is done. You simply pay attention to what’s going on in yourself. What concerns or interests or confuses you. On the inside, not the outside. Let go of the material world and concentrate on what’s happening in the world of you—your mental-emotional world. In my last post (Reflection 316) I listed several (what I call) dimensions of consciousness. I divided them into two groups, 1) a perceptual group leading up to a sense of the situation you’re facing at the moment, and 2) a planning group of dimensions leading to actions you take in dealing with that situation. One way to self-reflect is to run through the list of conscious dimensions to see which dimensions of your mental life are prominent at a particular moment of engagement, then to devote attention to the ones that stand out to see what’s going on with yourself. Here I offer such a list, more-or-less in the order in which they might come into play. Think, for instance, of a situation you are engaged with in which you recently felt glad, mad, sad, or any other way. What aroused your interest or concern? What did you see (hear, touch, taste, smell)? What did you recognize as familiar? How did you understand what was happening? What were your values at the time? How would you describe the situation you were in? How did you judge that situation? How did you plan to achieve it? Did you get help or tell others about it? That pretty much covers the inner span of your loop of engagement if you’re committed to figuring things out for yourself. If you’re on automatic pilot based on rote or ideological responses, you can skip all those steps and act unconsciously, not consciously. Self-reflection is a tool for effective use of your conscious ability to solve problems. If you already know all the answers before the questions are even asked, you probably won’t get any benefit from the exercise. But if you really want to understand yourself better, it’s worth whatever effort you put in. 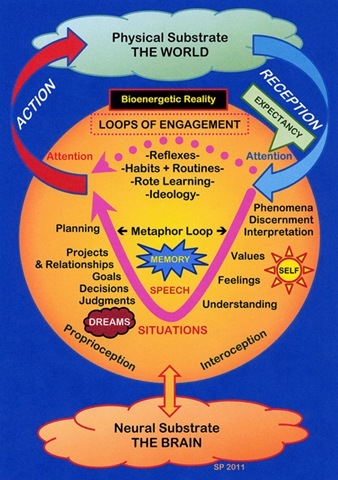 Here’s a map of my personal loop of engagement showing two alternate routes, the habitual-ideological and the longer, full consciousness route I am recommending here. My list of the dimensions of consciousness pretty much follows the lower (solid) loop from right to left, moving right along from sensory phenomena to situations, and on to actions in the world. As you can see, the upper (dotted) ideological route skips all that and connects directly to actions without due consideration. That’s an outline of my method of self-reflection from a phenomenological point of view as laid out in greater detail in CONSCIOUSNESS: The BOOK.